Back in August of this year a good friend of mine, Jon Garrett and I decided to do an overnight camping trip to The North Rim of the Grand Canyon. Not as well known as the South Rim but just as spectacular. 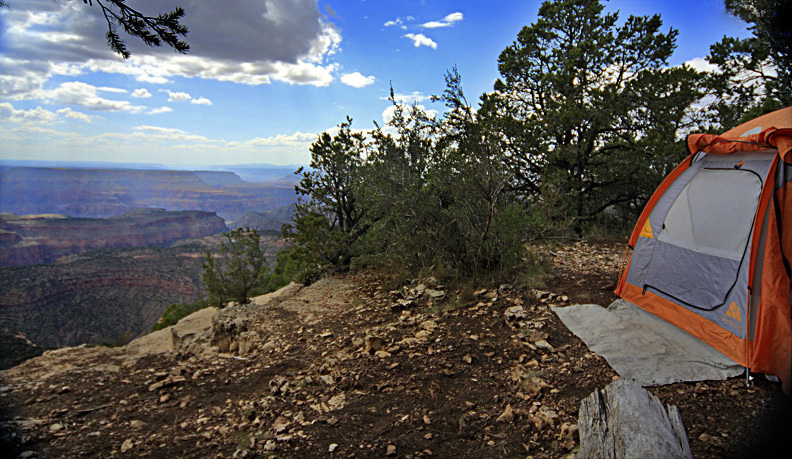 The North Rim doesn’t get the tourist abuse like the South Rim, especially if you only venture into the Kaibab National Forest, not the Grand Canyon National Park itself. What’s great about camping in national forests like the Kaibab is that the camping is free and you can collect and torch all the firewood you can gather. As long as the wood is dead and not attached to anything living. Based on local inside information we gathered from friends, we searched for a campsite that would be literally perched on the rim itself and the pic below shows where we ended up. I think Jon’s tent was about ten feet from the rim. After I gathered all the firewood and Jon repaired the fire pit, we ventured out along the rim for some sunset shots. 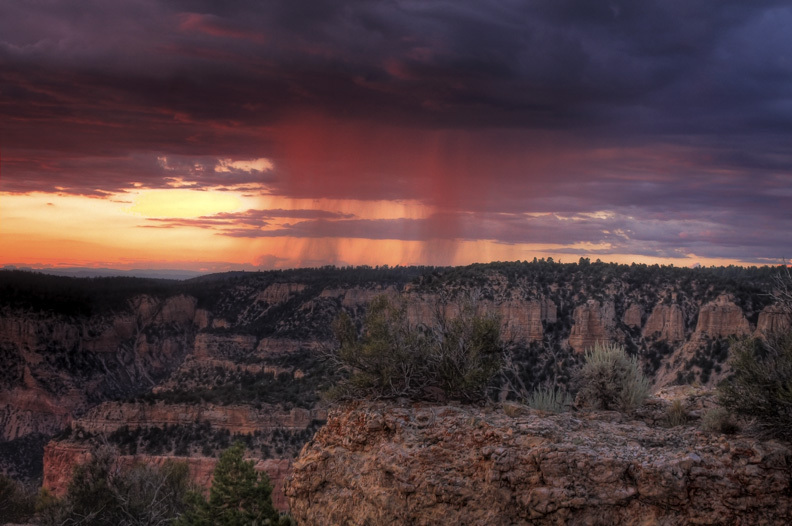 One of the reasons I wanted to go to the North Rim in August is because it’s monsoon season in Northern Arizona. Monsoon season means rain, thunder and of course lightning! 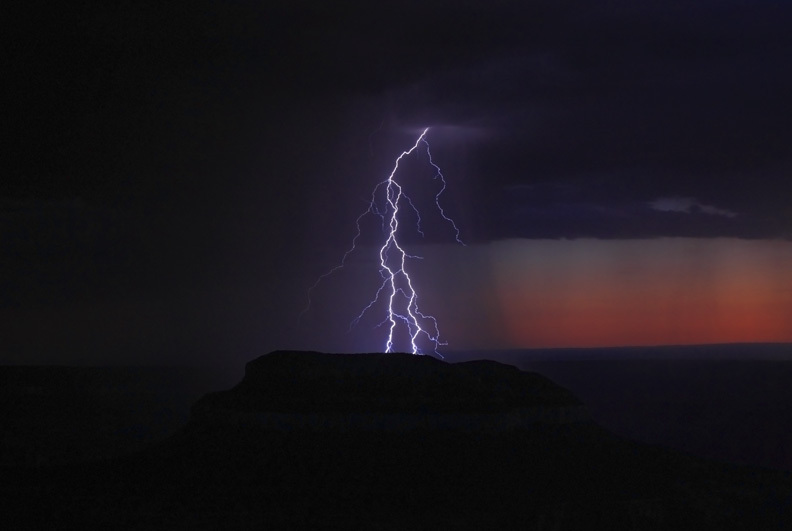 Before you risk your life to photograph lightning, you need to weigh the dangers of doing so. 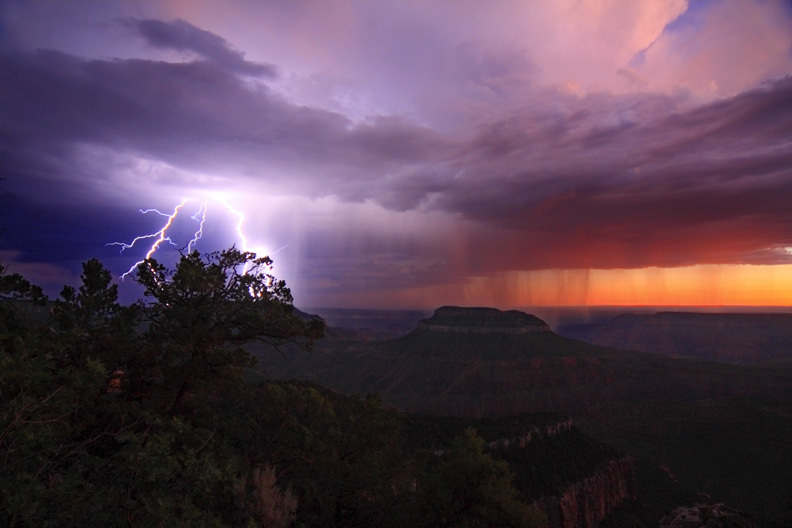 Lightning kills especially along the rim of the Grand Canyon. A tourist was killed this year on the South Rim. Here’s a link from our friends from NOAA describing how lightning forms and the dangers of. About Lightning. I had never photographed lightning and really didn’t possess the necessary equipment to do so properly. There are lightning sensors or triggers that you can attach to your camera’s hot shoe that will trigger the shutter when the sensor picks up lightning strikes even during daylight. Here’s a link where you can buy one. Another cool gadget I need. Maybe they’ll send me a free one for providing this link! Or this could make the perfect Christmas gift? It’s only $329. It was about an hour before sunset and there were storm cells forming in the western sky. On the rim of the Grand Canyon, you can see for miles. We observed one cell tracking north of us and one tracking south of us. You can also see pockets of rain which during sunset , look red. See photo below. 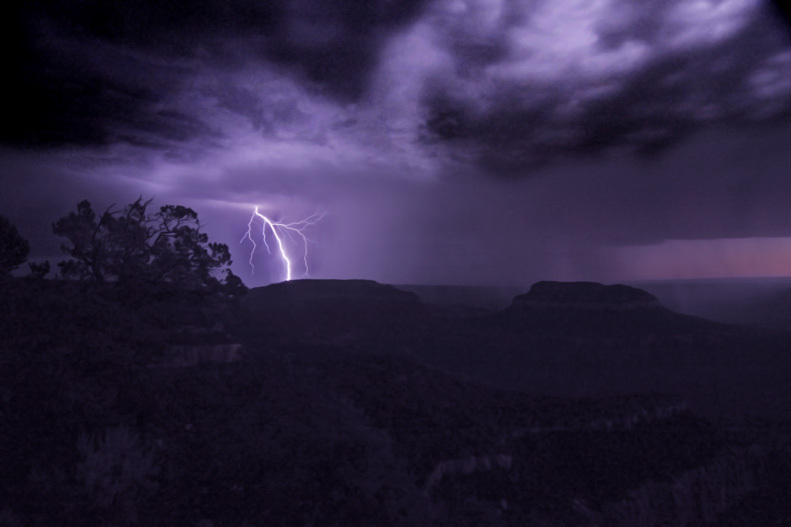 As it got darker, we observed lightning strikes to our south along the south rim. The storm was approaching fast and it was starting to become quite a show. Jon and I were oohing and aahing as the storm started to produce lightning every minute or two. It was like a Fourth of July fireworks show. I set my camera on my tripod and experimented with different exposures. I attached my Sigma 12-24mm wide angle lens on my camera in order to give me the best chance to capture a strike. I manually focused on infinity and my f-stop was set at f7 and my ISO at 200. I also used a neutral density filter in order to darken the skies thereby allowing me to increase my exposure time. The longer exposures were necessary if I wanted to capture that elusive lightning bolt. I tried exposures of 1 to 4 seconds at first but as it got darker, my exposures increased to between 20 and 30 seconds. I probably triggered about 40 exposures and captured 10 lightning strikes. 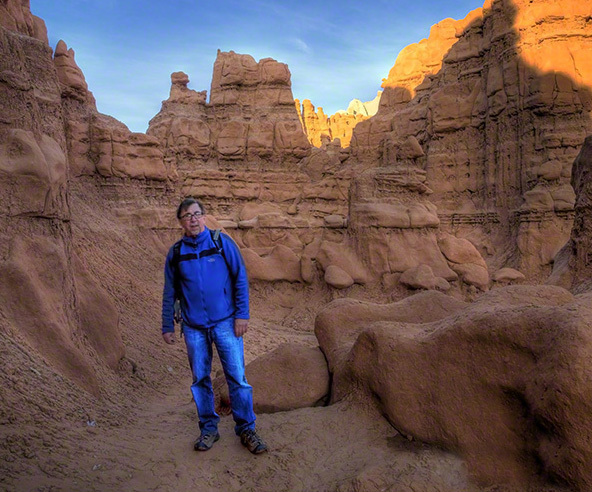 During this time, I was concerned with noise appearing on my images as my sensor got hotter. This indeed occurred even though I had my camera’s noise reduction set for long exposures. In Photoshop, I was able to reduce most of the noise without losing too much detail. As the storm moved to the east, I had to continually reposition my camera to guess where that next bolt would occur. Below are my favorite images from the night. The sun has just set. I was extremely lucky to get this one since my exposure was for only for 1 second. This exposure was for 25 seconds as it was much darker. The next time I try photographing lightning, maybe I’ll have that $329 gadget. I may also try my 10-stop neutral density filter will which will allow for much longer exposures thereby increasing the odds of getting the ultimate shot. There was one spectacular strike that literally filled the whole sky but I missed it. There will be a next time. Good stuff Mike! What a great night!